In some ways this year seems to be a bit of water treading as we continue in the same direction as the previous year. But it was a successful direction for Marvel so it makes sense. We are still seeing some breaks in comics conventions, such as Thor (finally!) revealing his secret identity to Jane Foster, and Peter Parker and Betty Brant moving on from their endless doomed mooning over each other. Those may not seem like major changes but this was a time when most comics were kept in a permanent limbo, with no changes to the status quo. Even the changes to the Avengers' line-up (Quicksilver and the Scarlet Witch leave and the Wasp and Henry Pym - in a new identity - return) was something new. 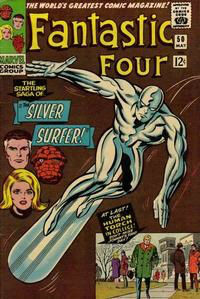 The idea that events in one issue had a long term effect on the overall run of the comic, let alone the entire company's line, was still an innovation at this time. Multi-part stories are becoming more and more common. The FF especially starts seeing some major epics and introducing the long-continuing subplot regarding the Inhumans' imprisonment. A (barely animated) cartoon series featuring cut-outs replaying issues of actual comics played on televisions this year. Captain America, Hulk, Iron Man, Thor, and Sub-Mariner were the lead characters. Creator notes: Towards the end of this year we start to see some fresh faces. The most significant is John Romita Sr. taking over Spider-Man (he started off on Daredevil at the beginning of this year). Spider-Man was the best Marvel book, but towards the end of the Ditko run it started to decline. With Romita coming on Spidey launches right back up to the top. We also see Gene Colan come in on Daredevil which is pretty nice. On the writing side, Roy Thomas becomes the first writer to have a regular run besides Stan Lee. He takes over the X-Men and then the Avengers (he started with some scripting on Dr. Strange stories that are included in last year's category because they are part of a multi-part epic; he was also writing Sgt. Fury at this time). 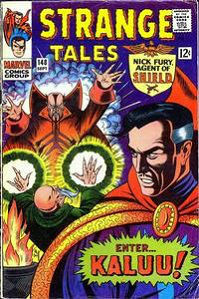 Kirby continues to go full-forward crazy on FF and Thor while Ditko leaves the company. Marvel's popularity was also helped by the debut of the Batman television show this year, which helped the entire industry. Martin Goodman moved Marvel to a bigger office and hired an actual production staff, including John Verpooten and Morrie Kuramoto. Notable events: Introduction of Savage Land vibranium, the creation of the Cosmic Cube, the first sightings of the Negative Zone, and the coming of Galactus. The Hulk, who has been going through all sorts of permutations, finally settles on the classic Hulk Smash! persona. The Red Skull's first Silver Age appearance is here. New characters: Batroc, Collector, Silver Surfer, Galactus, Black Panther, Klaw, the Rhino, Mary Jane (1st published), Super-Adaptoid, Bill Foster, Tana Nile, Ego the Living Planet, High Evolutionary, and the Living Laser. Strange Tales #136-145 (Nick Fury) 1st Mentallo & Fixer. 1st Jasper Sitwell. 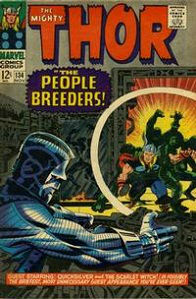 Tales To Astonish #78-81 Classic "Hulk smash!" persona. 1st Secret Empire. 1st Boomerang. Avengers #26-27 Wasp's powers change. Fantastic Four #48-50 The coming of Galactus! Avengers #28-29 Henry Pym becomes Goliath. J: Goliath & Wasp. 1st Collector.